"GED" redirects here. For other uses, see GED (disambiguation). The American Council on Education (ACE), in Washington, D.C. (U.S.), which owns the GED trademark, coined the initialism to identify "tests of general equivalency development" that measure proficiency in science, mathematics, social studies, reading, and writing. Passing the GED test gives those who do not complete high school, or who do not meet requirements for high school diploma, the opportunity to earn their high school equivalency credential, also called a high school equivalency development or general equivalency diploma. It is called the GED in the majority of the United States, Canada, or internationally. In 2014, some states in the United States switched to alternate exams, the HiSET and TASC. 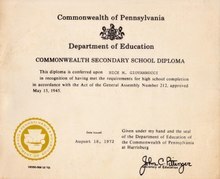 In New York, if the examinee successfully passes all their TASC exams, the examinee would earn a High School Equivalent diploma (Abbreviated as HSE), which replaced the GED diploma. In addition to English, the GED tests are available in Spanish and in French in Canada, large print, audio, and braille. Tests and test preparation are also offered to persons incarcerated and on military bases in addition to more traditional settings. Individuals living outside the United States, Canada, or U.S. territories may be eligible to take the GED tests through Pearson Vue testing centers. Utah’s Adult High School Completion program has been used as an alternative for individuals who opt to earn a diploma. In November 1942, the United States Armed Forces Institute asked the American Council on Education (ACE) to develop a battery of tests to measure high school-level academic skills. These tests gave military personnel and veterans who had enrolled in the military before completing high school a way to demonstrate their knowledge. Passing these tests gave returning soldiers and sailors the academic credentials they needed to get civilian jobs and gain access to post-secondary education or training. ACE revised the GED Tests for a third time in 1988. The most noticeable change to the series was the addition of a writing sample, or essay. The new tests placed more emphasis on socially relevant topics and problem-solving skills. Surveys of test-takers found that more students (65%) reported taking the test with the intention of continuing their education beyond high school, rather than to get better employment (30%). A fourth revision was made in 2002 to make the test comply with more recent standards for high-school education. A fifth revision was released on January 2, 2014, to be delivered on Pearson VUE, a proprietary computer-based testing platform. The new test applies to the United States, but not to Canada or international locations. It retained four content areas but with different content — language arts, mathematics, science, and social studies — that "measure a foundational core of knowledge and skills that are essential for career and college readiness." Official GED Testing Centers are controlled environments. All testing sessions take place either in person or online according to very specific rules, and security measures are enforced. Breaks may be permitted between tests, depending on how many tests are being administered in a session. There may be restrictions on what test-takers may bring into the testing room. Colleges admit that grades based upon high school may require a minimum score on the GED test for admittance based upon the test. For example, Arizona State University requires an average sub-test score of 500 in addition to the certificate. Some say overall, there is a certain level of stigma for GED certification holders that affects employability or pursuit of higher education. There are calls for the GED to be abolished. Those who support abolishing the GED say the program reduces high school graduation rates, is outmoded, and is a big financial burden for low-income participants. ^ "GED®: Get Your GED - Classes, Online Practice Test, Study Guides, More". GED. ^ "Iowa is the Fifth State to Choose ETS's HiSET". Archived from the original on 2014-03-11. Retrieved 2019-02-04. ^ "Information about ESOL and Basic Education for Adults in New York City". Information about ESOL and Basic Education for Adults in New York City. ^ "What is TASC and HiSET". GED Board. ^ "What is the HSE/TASC™ Test?". 22 June 2015. ^ "What is the GED® Test". Archived from the original on 2013-03-28. Retrieved 2019-02-04. ^ "Special Test Editions" Archived 2013-03-28 at the Wayback Machine, Retrieved February 19, 2013. ^ "International GED® Testing", Retrieved February 19, 2013. ^ a b c d "History of the GED® test". GED Testing Service. GED Testing Service LLC. 2015. Archived from the original on 2013-02-09. Retrieved February 19, 2013. ^ a b "The new assessment is a stepping-stone to a brighter future". GED Testing Service. GED Testing Service LLC. Archived from the original on October 23, 2013. Retrieved October 22, 2013. ^ "Can I take the test online? ", [yes the test can be taken online], Retrieved April 10, 2018. ^ "MyGED FAQs". GED Testing Service. Archived from the original on 2016-04-28. Retrieved 21 April 2016. ^ "High School Equivalency (GED-HiSET-TASC)". MyCareerTools. Archived from the original on 2016-09-15. Retrieved 21 April 2016. ^ "Programs and Services: FAQs". GED Testing Service. GED Testing Service LLC. 2015. Retrieved August 7, 2016. The cost of the 2014 GED® test will remain at $120 per test battery administration…. ^ "What Is an Honors GED?". Everyday Life - Global Post. Retrieved 2016-03-19. ^ "Testing Services - Mesa Community College". mesacc.edu. ^ a b Cameron, Stephen V and James J. Heckman (1993). "The Nonequivalence of High School Equivalents". Journal of Labor Economics. 11 (1): 1–47. doi:10.1086/298316. ^ Chandler, Michael Alison (31 January 2015). "Should GED lead to a diploma? District considers changing policy to help outcomes". The Washington Post. Retrieved 16 January 2018. ...Advocates say that offering the students a diploma, as Maryland and 12 other states do, would wipe clean a stigma that makes it harder for GED graduates to get a job or pursue higher education. ^ Chen, Michelle (5 May 2014). "The GED Is Getting Tougher for Students Who Need it Most". The Nation. Retrieved 16 January 2018. The GED carries a stigma of mediocrity and may put people at a disadvantage when competing for jobs against full-fledged high school graduates. ^ Heckman, James J.; LaFontaine, Paul A.; Rodriguez, Pedro L. (2008). "Taking The Easy Way Out: How The GED Testing Program Induces Students To Drop Out": 4. CiteSeerX 10.1.1.378.8881. ^ Schlueter, John (10 June 2015). "To Get More College-Ready Students, Drop the GED". The Chronicle of Higher Education. Retrieved 16 January 2018. GED Technical Manual, 2nd Edition. (1998). Washington, DC: GED Testing Service of the American Council on Education.